Support for high-resolution video over DisplayPort connections in a desktop KVM switch. Supports the DisplayPort video standard, with high resolution video up to UXGA (1600 x 1200), full HD (1920 x 1080), and WUXA (1920 x 1200), and WQXGA (2560 x 1600, dual-link). Also supports KVM, audio, and USB switching independently or in unison to other connected devices. Supports DisplayPort 1.1 compliant, four lanes at 2.7 gB/s. Supports USB keyboards, mice, and USB peripherals. Four computers share up to four different USB peripherals (2 HID, 2 USB 2.0). True USB 2.0 emulation technology. Front-panel push buttons and hotkey functions for easy computer selection. Activate autoscan by pressing front buttons. Support keyboard and mouse plug-and-play. In additon to these other features, this desktop switch supports independent simultaneous device selection. Work on one computer while USB peripheral are connected to other computers. DisplayPort video card drivers need to be installed correctly on the target computers. The 4-Port Wizard Desktop KVM Switch DisplayPort USB comes with a standard 2 Year Double Diamond™ Warranty (Standard) already included. 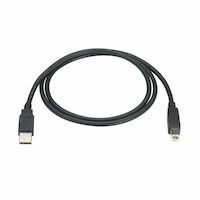 USB 2.0 Cable - Type A Male to Type B Male, Black, 10-ft.